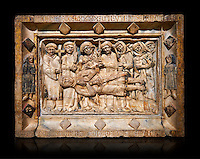 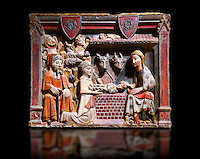 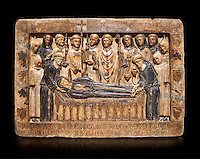 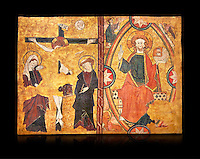 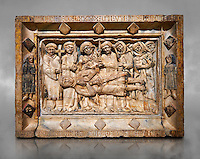 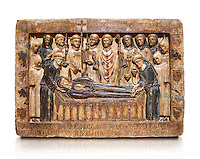 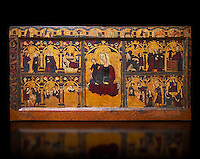 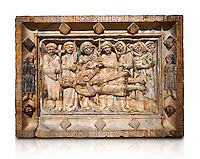 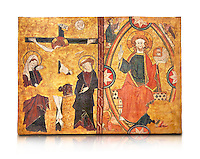 Pictures and images of the Gothic art and artefacts from the MNAC museum collections, Barcelona. 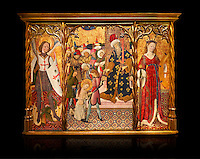 One of the most spectacular and important collections of Medieval Gothic art are the Catalan Gothic artworks in the National Museum of Catalan Art ( Museu Nacional d'Art de Catalunya or MNAC), Barcelona, Spain. 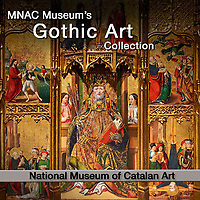 The MNAC collection of Gothic art shows Gothic sculpture and paintings from the 13th to 15th century. There are important sculptures in the Gothic collection by Jaume Cascalls and Pere Sanglada, and the paintings Pere Serra, Lluís Borrassà, Bernat Martorell and Jaume Huguet. 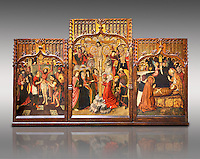 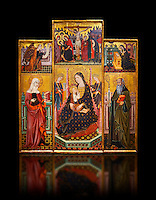 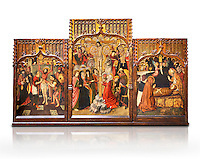 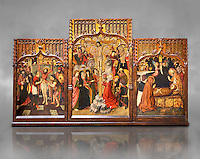 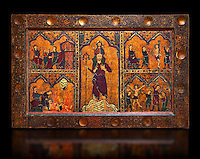 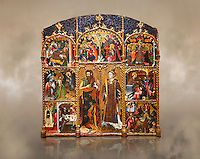 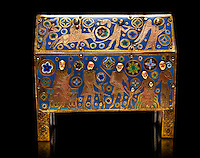 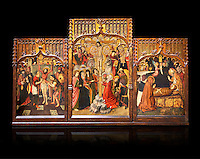 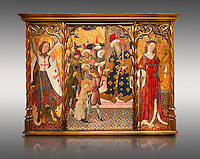 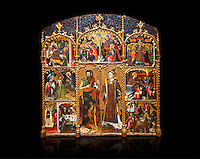 The artworks cover works from different stylistic phases using the various different techniques (mural paintings; panel paintings; stone, ivory and wood sculpture; metalworking and enamels). 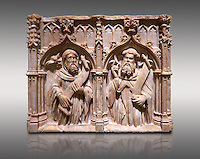 Gothic art emerged in Île-de-France, France, in the early 12th century at the Abbey Church of St Denis built by Abbot Suger it is hardly surprising then that the best early examples of Gothic art are religious in nature. 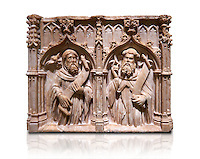 The earliest Gothic art was monumental sculpture, on the walls of Cathedrals and abbeys. 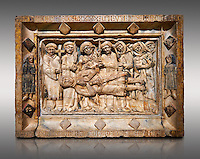 Christian art was often typological in nature, showing the stories of the New Testament and the Old Testament side by side. 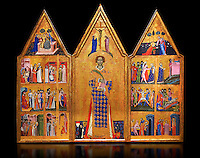 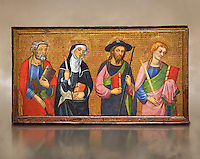 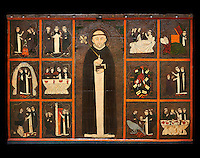 Saints' lives were often depicted. 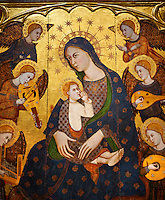 Images of the Virgin Mary changed from the Byzantine iconic form to a more human and affectionate mother, cuddling her infant, swaying from her hip, and showing the refined manners of a well-born aristocratic courtly lady. 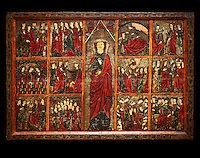 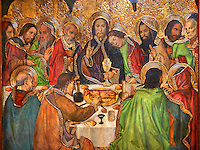 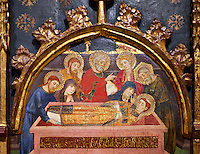 The Catalan Gothic style is tied closely to French Gothic although there ere influences from Italy as can be seen in the the Triptych of Sant Vicenç d'Estopanyà, probably by an immigrant Italian artist, and altarpieces by the Serra brothers. 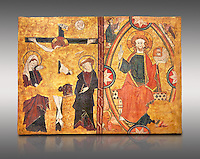 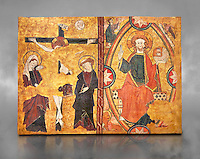 The Serra family were highly influential in steering the course of Catalan painting during the closing decades of the 14th century. 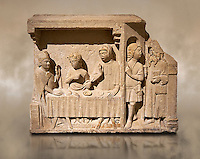 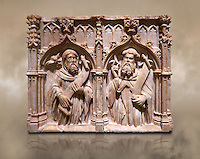 Jaume Cascalls is one of the most important sculptors of the fourteenth century in Catalonia. 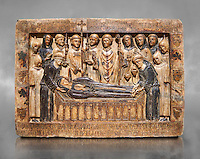 This is borne out by his involvement over almost thirty years with the project of the royal pantheon in Poblet for King Peter the Ceremonious and with other large undertakings of the time. 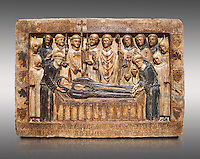 Today, on stylistic grounds, he is credited with this 'Head of Christ', which must have formed part of a sculptural group of the Holy Sepulchre. 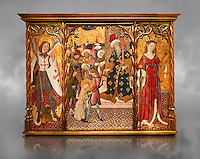 The collection go Gothic art at MNAC shows the development of the Gothic style from its stylistically naive beginnings to the great accomplishments of Jaume Cascalla. 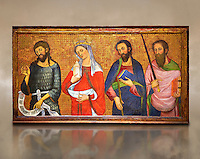 Like its Romanesque predecessor Gothic paintings are still two dimensional and heavily steeped in the iconography of the Roman Byzantine Empire that did not fall until 1453. 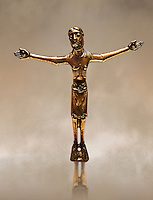 The Head of Christ by Jaume Cascalls heralds the realistic humanist style of the Renaissance that will overtake the Gothic style in popularity. 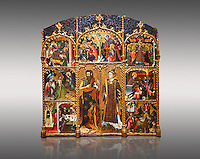 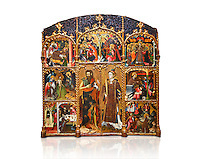 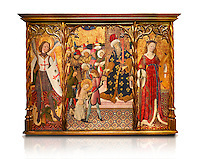 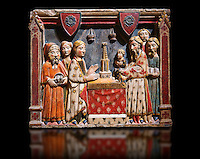 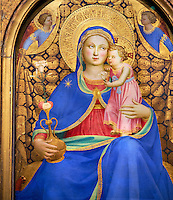 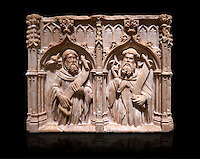 Download Pictures and images of the Gothic art and artefacts or buy as photo art prints on line. 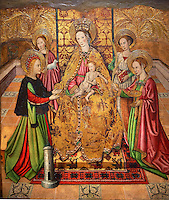 Non editorial and personal usage rights must be obtained from the MNAC Barcelona.